Peter Bruegel the Elder’s Dulle Griet has regained its spectacular original appearance with the rediscovery during restoration of a blue-green sky. Experts at the Royal Institute for Cultural Heritage (KIK-IRPA) in Brussels have worked for a year and a half on the treatment of the world-famous painting. Bruegel’s refined brushwork and a number of striking details lay hidden for decades under layers of overpainting and yellowed varnish. The original wealth of colour is now visible again and the work looks remarkably fresh. The painter’s artistic qualities are done full justice once more. The multidisciplinary research carried out by the KIK-IRPA team has also resulted in several eye-catching discoveries. The painting does not date from 1561, for instance, but from 1563 – the year in which Bruegel married and moved from Antwerp to Brussels. 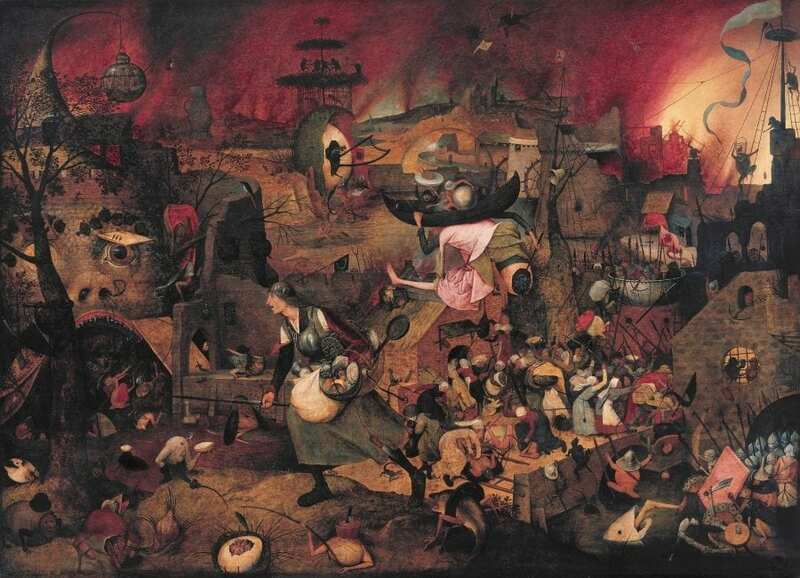 The Institute’s high-tech equipment allowed analysis of the work’s various underlying layers and it was also determined that Bruegel did not, after all, inscribe the panel with the word ‘Dul’ as a title. Both finds offer a fresh insight into the many mysteries that continue to surround Bruegel. The restored panel is now in excellent shape for the upcoming Bruegel celebrations. It will shortly travel to the Kunsthistorisches Museum in Vienna, where it will be one of the highlights of the large-scale international Bruegel exhibition. Dulle Griet will then return to the museum in the spring of 2019.